Rostrevor teams were greeted with very pleasant playing conditions on Saturday morning as all of the various summer sporting competitions are now in full swing. For those of you who have been seeking a full term's fixture of games, please note that this is still a work in progress. The SAAS competition has a new director and he is working hard to get his head around fixtures, therefore I ask that you continue to have patience with him. This was a strong win after the disappointment of last week. The focus at training all week was batting and our run chase was exceptionally pleasing. After losing the toss and bowling first, Murphy Short was immediately hitting the right areas causing the St Michael's batsmen problems by bowling full and straight. Our bowling across the board early was a little inconsistent and St Michael's reached 2/79 and looked set to post a strong total. Riley Slack was introduced into the attack and straight away, from ball one, he hit a dangerous line and length and for the second time in as many weeks found a valuable break through. This opened the flood gates and from there regular wickets fell. Kyle Brazell bowled beautifully and was supported by Short in his second spell. Cameron Taheny in his first game bowled with good pace and looks a real talent moving forward. For us as a team to take 8/22 to finish off the St Michael's innings was very pleasing with Slack's catch to dismiss St Michael's most valuable batsman a real highlight of an otherwise slightly inconsistent fielding performance from us as a team. Harrison Rahaley finished off the innings with a fantastic slower ball that caused all sorts of confusion for the St Michael's number 11 batsman. Special mention to Stefan Lanzoni, on debut for his tidy work behind the stumps. In reply, Dylan Fitzsimons and Brazell looked solid against some excellent bowling with the new ball. After a slow start that yielded only 9 runs from our first 6 overs, both of the boys accelerated the scoring and put on 71 for the first wicket in 19 overs. Harrison Rahaley joined Fitzsimons at the crease and with one run short of 50 and also us winning the game, Fitzsimons holed out for a well compiled 49. Sam Rahaley joined his brother as we batted for another 20 minutes after passing St Michael's total. Both of the boys received valuable time in the middle, with Harrison Rahaley finishing with 47no. Our message after the game was that we need to find an end to our inconsistency this year. A poor game has been followed by an excellent game. Next week takes us to St Peter's, who are the benchmark of the competition. We go there on the back of a good win to try and find the consistency of performance we are after. Congratulations to Stefan Lanzoni (#686) and Cameron Taheny (#687) who both made their debuts on the weekend. They were presented with their caps by Justin Chung, current staff member, old scholar and current ROCCC president. Year 10 Lachlan Barr recently competed successfully in the SA State Athletics Championships claiming gold in U17 Hammer and Discus. He has now qualified to compete in the Australian National Juniors to be held in Sydney in March. 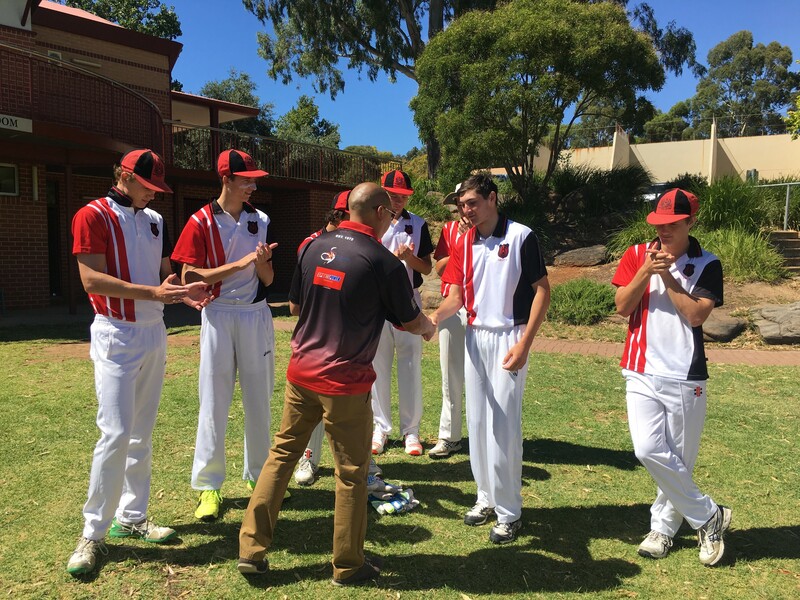 Congratulations to Year 10's Kyle Brazell and Christian Leddicoat along with Year 9 Sam Rahaley as they have all been selected into the South Australian U15 cricket team that will be competing in the upcoming National Championships to be held in Queensland. 2nd XI cricketer Mackenzie Heath helped take the score from 5/50 to 9/253 against Concordia by compiling an impressive 138no. 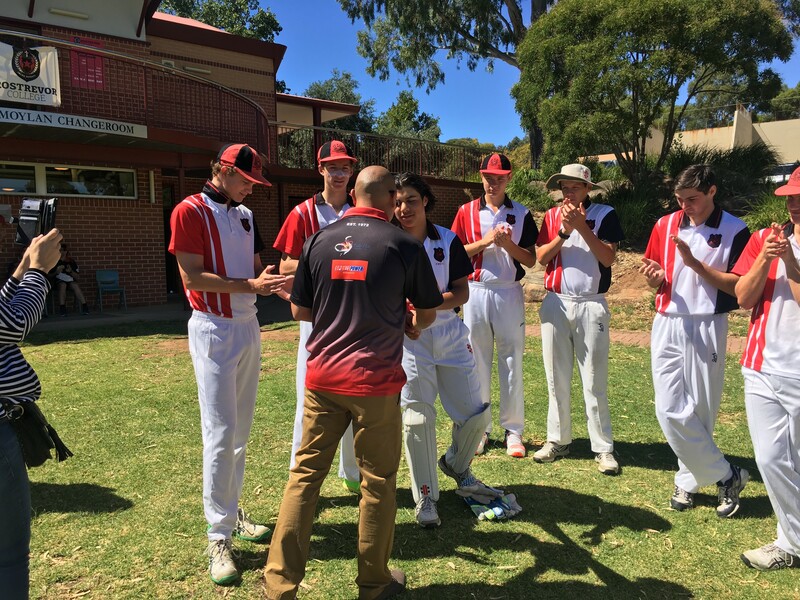 Regular 9A cricketers Jake Slivak and Matt Dnistriansky were called up to play 10A cricket against PAC on Saturday and were strong contributors to the 10A's win with Jake scoring 54 and Matt 37, whilst Matt also claimed a wicket. The FFA Futsal Nationals were held in Sydney in January and Rostrevor was well represented by Paul Leombruno in the U14's competition (Year 10) and Noah McNamara (Year 9) in the U13 side. Paul's U14 team won 4 matches and drew 1 in their group stage to play in the semi-final against the very impressive Solomon Islands team. Unfortunately, they lost the semi-final but had a fantastic tournament to be proud of. Noah's U13 team won all 8 group matches plus their semi-final against NSW Metro Lightening but unfortunately then lost to NSW Metro Thunder in the Grand Final played at Sydney Olympic Park.